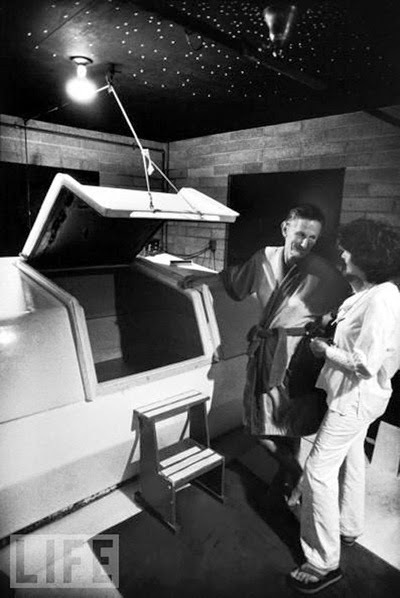 John Lilly, his wife, and a floatation tank. From "Brief History of the Floatation Tank"
NOTE: Updated with Caroline Contillo's instructions for beginning mindfulness meditation. Oz Fritz has a new post up on "How to Use a Floatation Tank." Oz writes, "Lately I’ve been asked by a few people the best way to use a floatation tank. This has been my responseso far. I've been working with a tank for almost 10 years on a daily basis and I can say unequivocally that the best way to use a floatation tank is to open the door and get in it." Oz writes about his experiences with tanks and how using them have helped him. Oz is less enthused about his experiences with silent meditation. He didn't enjoy saving money at the Sivananda Yoga Center. "The rent was very low, but there was an obligation to attend their mediation service held every morning at 6 am. 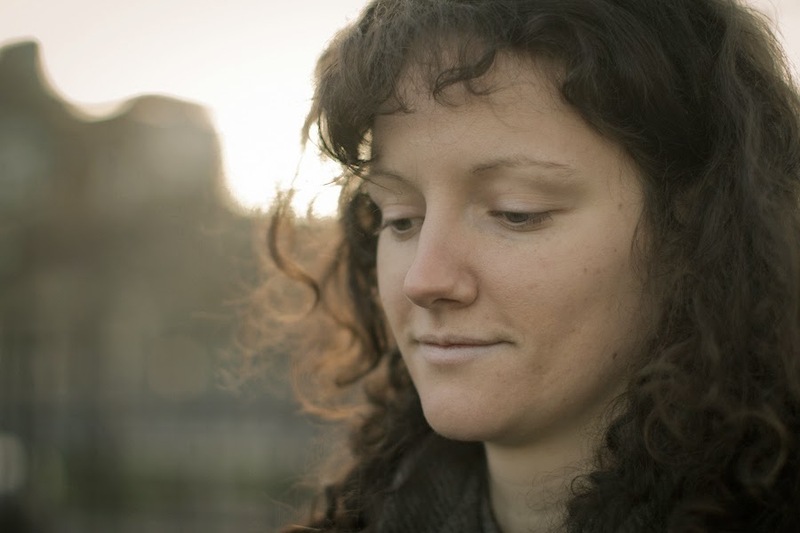 It started with a half hour of seated, silent meditation which I found torturous." Maybe the instructions he was given weren't very good? I've had better luck with the Theravada silent meditation, i.e. insight meditation. Caroline Contillo, an insight meditation instructor and a Robert Anton Wilson fan, recently Tweeted: "for those who don't meditate because of the fear of sitting for long periods of time in silence: i have found that consistency rather than duration is the key to developing a practice. meditate at the same time for 3 minutes every day for a week and monitor any transformation in quality of attention." I could not find Caroline's beginning instructions for mindfulness meditation, but here are some from someone else, Chris Walsh. UPDATE: Caroline, overcoming Internet vicissitudes, has now posted an updated version of her meditation instructions. Thanks, as always, for the plug, Tom! To clarify, though I didn't take to the morning seated meditation at the Yoga Center, otherwise, I thoroughly enjoyed living there. It seemed situated at a crossroads of a particular kind of spiritual movement not only of the Vedanta orientation there, but a lot of people from various disciplines came through for the classes, meals and workshops - Rosicrucians, Rajaneesh ( as he was then known) people, Muktananda and Satchitananda students etc. One thing I admired about RAW was that he would talk and write about floating and sensory deprivation as one technique for metaprogramming even though he didn't care for the experience of floating. Inner calm is to be cultivated together with love, and it is helped by a regular program of daily meditations. The difficulties in meditations cannot be overcome through discouragement. The Saints are the ones who were never discouraged. Only optimism gives us the strength and vibrations necessary for expanding our consciousness and placing us in tune with Everything. It is not the lack of experiences that generates discouragement but (even though it seems like a paradox) it is actually discouragement that blocks achievement of any experience. Therefore we should sit down with optimism, faith, joy, love and cheer and this way all our energies will flow automatically upwards and gather without effort at their focal Center, taking us rapidly into the presence of the Light of God.